This was my first dine-in lunch at Rama’s – they only open for lunch on request, and we had a big group to catch up with friends visiting from Papua New Guinea. We all had the $30 per person banquet, which included a huge range of delicious dishes. We started with pappadoms and minted yoghurt, which were crispy and a perfect appetizer. Next were the samosas, which were packed full of delicious filling and came with a lovely dipping sauce, as did the bahjia after that. The food was well-paced, giving us plenty of time to chat in between courses but not leaving us hungry. I was very excited when it was curry time – there were so many choices! I started with the chicken korma and found myself coming back to it again and again. The creamy flavour was so rich and complex, without being overly spicy (we’d requested a ‘medium’ level of heat for the curries). The beef vindaloo was, unsurprisngly, quite spicy, but again it had great complexity of flavour that I absolutely loved – I just needed a bit more rice than sauce for that one! 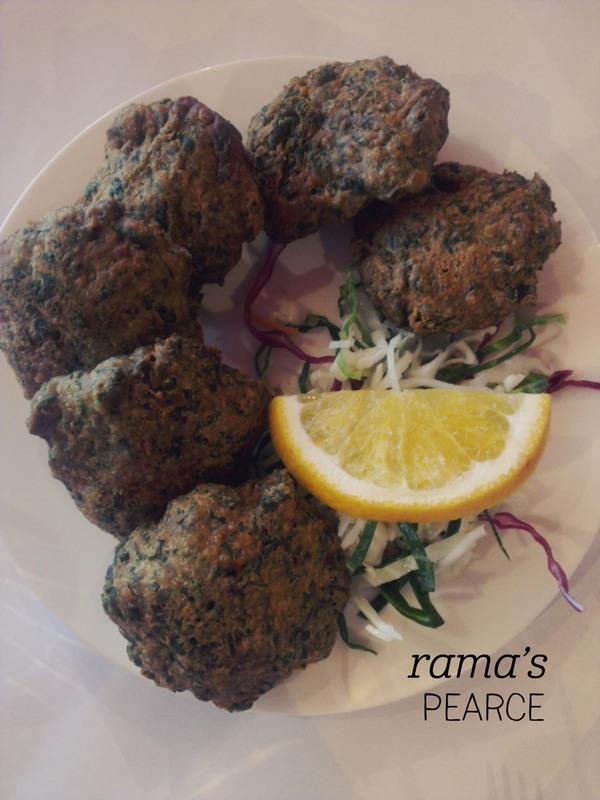 We felt so welcome it was almost like dining in someone’s home – Rama’s is a Canberra classic for a reason. 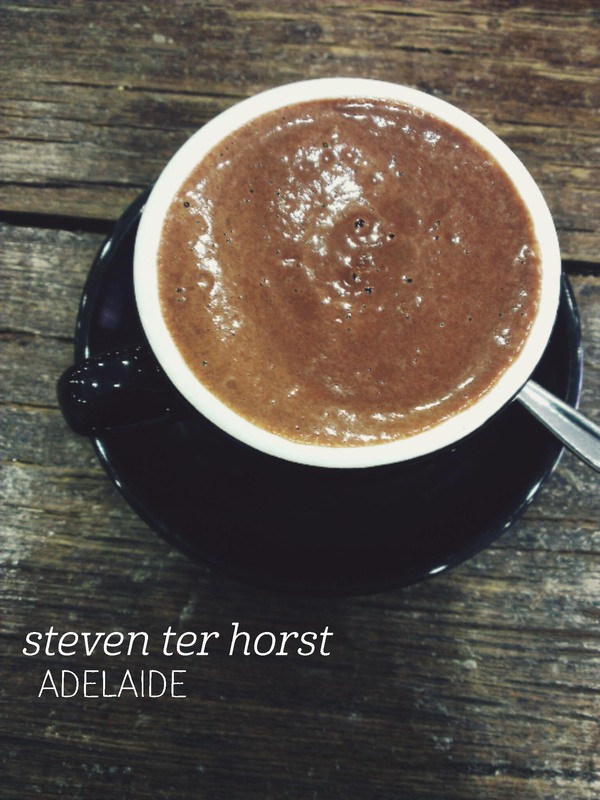 Adelaide has some fabulous independent chocolate stores, and Steven Ter Horst is one of the best. Craving something sweet after brunch, a friend and I dropped in to eye off the cakes on display. I was sorely tempted by the salted caramel tart, but seeing that they offered a ‘fruit de bois’ hot chocolate with strawberries, raspberries and blackberries, I was sold. They kindly made the mix dairy-free for me, using coconut milk and soy instead of milk. There was a short wait, but we sat comfortably at the large centre table, which was strewn with South Australian magazines. My mug came out and I was surprised at how thick the mix was – I adore true Italian hot chocolates and this was beautifully thick, apparently due to the berries. I ate it mostly with a spoon, to make sure I didn’t miss any. The dairy-free option in no way detracted from the flavour of the chocolate, which is an uncommon quality and reflects the care and talent that goes into their craft. The chocolate was rich, not sickly sweet, and given a delicate tartness from the berries. Well worth a visit. After my last visit to the Frugii Dessert Lab, I couldn’t resist popping in again after lunch at Hopscotch for a palate cleanser. It took me a while to convince my very-full-from-lunch colleagues, but my dedication to #icecreamthurs won out in the end (and I promised they’d get a mention – hi guys!). 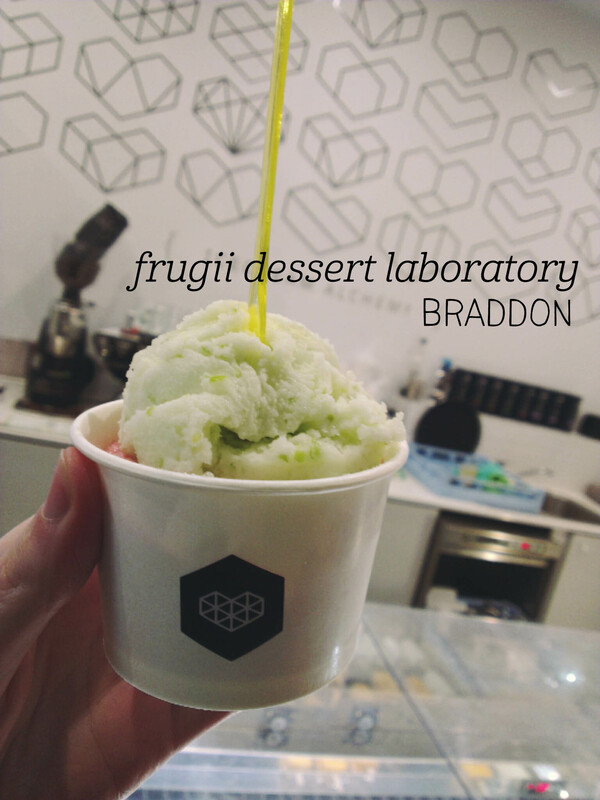 Frugii had two sorbet flavours on offer, so I hedged my bets and went half-half. First up: green apple sorbet. Yum, yum and yum. This one has such a crisp, clean green apple flavour – it’s not sickly sweet and it perfectly refreshing. I adored the tiny bits of green apple skin throughout, which added so much to the overall flavour (although it unfortunately led to quickly-escalating jokes about chunks – thanks guys!). Definitely one to get again. Underneath was a big scoop of flavour number two: blood plum. Eating sorbet, it turns out, is a good way to learn about unusual fruit. Having never had an actual blood plum before, I can’t tell how accurate the flavour is, but the sorbet has a lovely tart flavour that screamed ‘plum’ to me. I don’t know how they get their flavours so authentic but it really works. I bucked the trend at my most recent visit to the Hamlet and ordered a schnitzel from a bratwurst place. Yep. That’s how I roll. It was probably my best decision of the day – the Brathaus is one of the more recent additions to the Hamlet and offers tempting sausages and schnitzel in true German style. I picked the ‘Chicken Schnitty Burger’ – not part of the main menu, but handwritten on a whiteboard out the front (so apologies if it’s not a regular menu item – it should be). The schnitzel is without a doubt the best I’ve had in Australia – plump, tender chicken with a beautifully crispy panko crumb. My friend watched them cook hers and she said the secret is that they pop it into the oven to crisp up after frying. The bun was light and whilst there was plenty of salad, it compressed down nicely and wasn’t too hard to eat. The serving size was just right for me, although you can choose to have it with chips for an extra $3.50. My friend ordered the chips (fries) and we ended up sharing them – the serving was really generous. 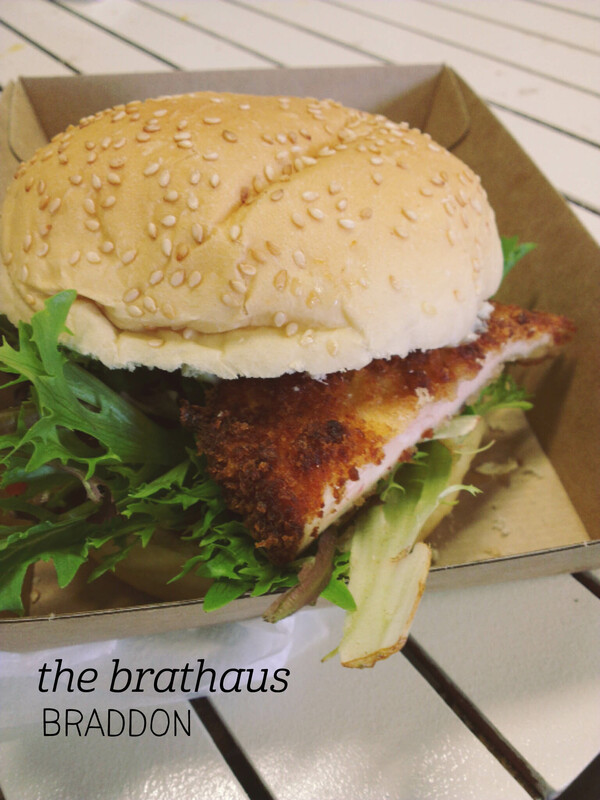 Definitely stop in to try the schnitzel if you can, it’s a winner. I’d wanted to visit Chuckle Park’s lantern-strung alley since I’d wandered past in 2012. It took me a while, but I got there for dinner one fine Melbourne evening – another of my solo dining experiences. I was lucky enough to get a table, and went up to the caravan to order. Sadly they’d run out of the meatball soup I’d wanted to try, but offered to make a meatball wrap instead. I ordered that with a cider, and took my number back to my table. The wrap came out fairly quickly, and it looked hearty and warm. On first bite this was confirmed – the wrap itself was a bit crispy and the filling, whilst a bit oily, was piping hot. The meatballs had a great kick to them and were not stingy on flavour. 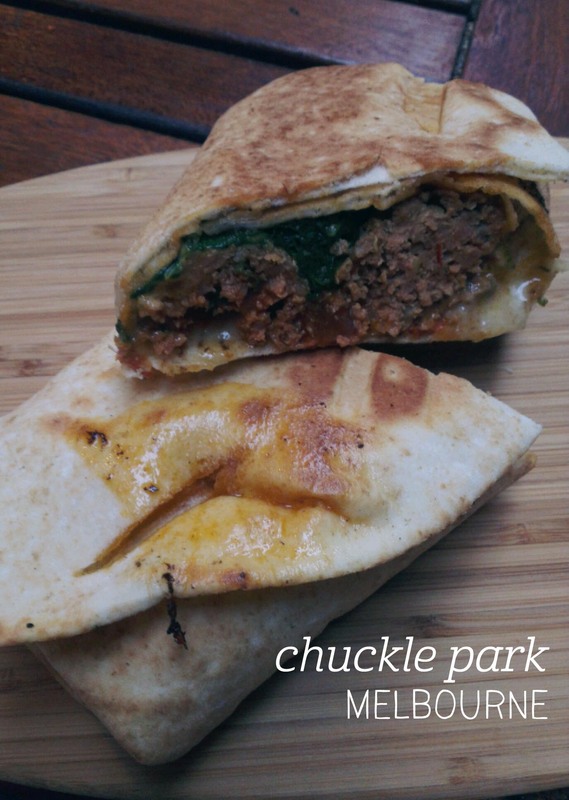 There was plenty of oozing, melty cheese inside, along with spinach and, of course, the meatball sauce. Each mouthful was delicious and the whole serve was so filling that I couldn’t quite finish it. My only criticism is that Chuckle Park allows smoking, which I felt detracted from my dining experience, otherwise I’d be back in a heartbeat. I met a friend at Cool Mac for an early weekday breakfast during my training week in Kirribilli, and we were both very impressed with what they had to offer. We sat outside on the sidewalk, which is something I really liked about this place – that, and it was one of the only places at the local shops open at 7am. I started with a Botanica cold pressed juice (bottled in the cutest jar), which was both healthy and refreshing. The owner was very friendly and patient while we chatted away before ordering – eventually I chose the eggs benedict and added a side of avocado (why not?). I consider eggs benedict a good test of a place, and Cool Mac passed with flying colours. The eggs were beautifully poached, there was plenty of rich but not-too-rich hollandaise, the bacon was plentiful and crispy, and whilst the toast was a bit crispy for me, it didn’t spoil the overall deliciousness. The avocado I added was a full half, and went really well with the dish – I’ll definitely keep this in mind for future orders. 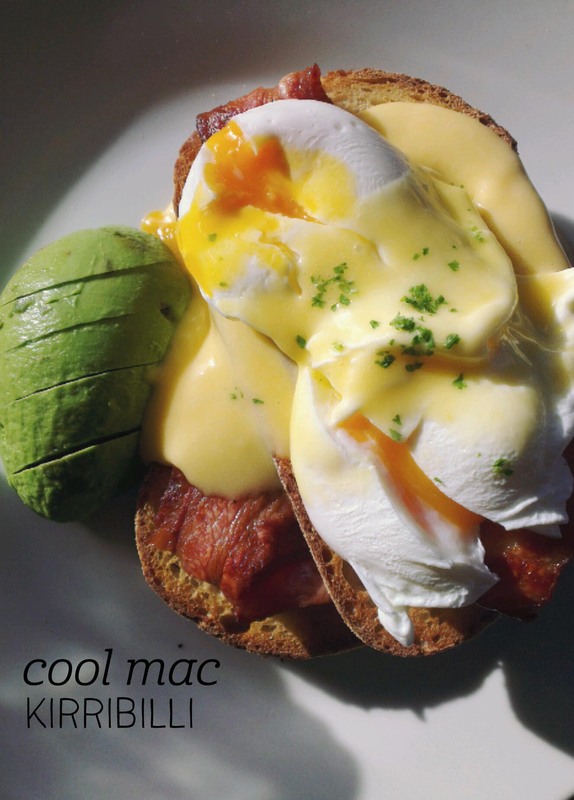 Cool Mac is a fun, friendly and tasty breakfast venue. Lonsdale Street Eatery (LSR’s alter dinner ego) is one of the many serious meat-offering establishments of Canberra. They offer BYO (no corkage charge – we also had to BYO bottle opener!) and have a lovely outdoor seating area, perfect for warmer nights. We went on the first night of their new menu, and the waitress was really lovely about tracking down details for us when we had questions. In the end, we chose the buffalo wings, the ‘pitt bull’ hot dog and the royale with cheese burger, all served in fun, branded, disposable packaging. The wings were amazingly crispy and whilst they didn’t have as much meat on them as other wings I’ve had, the flavour more than made up for it. Caution – the spicy dipping sauce was too hot even for my chilli-loving Dad. 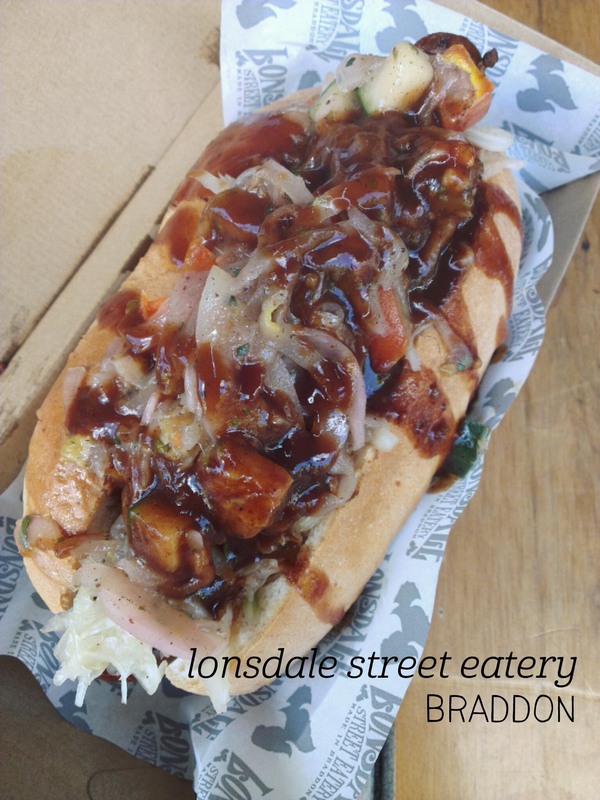 The ‘pitt bull’ hot dog was quite good – I enjoyed it more than the one I’d had at Broddogs – with a good kick from the horseradish slaw and jalapeno salsa. But the pick of the bunch was the royale with cheese – this is the mother of all cheeseburgers, with a pillowy soft bun, dense, meaty patty and oozing melty cheese. So, so good.